Infant massage is an activity you do WITH your child, not TO them. It is a wonderful way to connect with your baby and has many health and development benefits. To get started, position yourself and baby so you’re both comfortable. Sit on the floor with your back against the couch or wall, or kneel alongside your bed. In the early months babies like to lie in the natural cradle formed in your lap when you sit cross-legged; or just stretch your legs straight out in front of you. 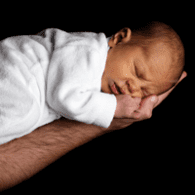 Place baby on a dryer-warmed towel or a soft blanket draped over your legs as a pillow. When baby grows out of your leg cradle, stretch out your legs alongside baby. Be sure to keep a spare diaper handy for the unexpected sprays. Veteran infant-massage instructors stress the importance of respecting baby’s desire for a massage. They advise, before laying on hands, asking baby’s permission – “Would you like a massage?” Babies become attentive to a setting event, a group of events that signal a familiar event will follow. When baby sees you rubbing oil into your hands and hears you pronouncing the cue word “massage,” watch for his face to light up approvingly. If baby is upset, it’s best to postpone the massage and just hold him awhile or use other comforting techniques. Remember, massage is something you do with your baby; if he’s not “with” you, wait until a better time. If he becomes upset during the massage at any point, stop and just hold him. Massage is not meant to be like a Band-Aid that you apply to a baby who is hurting, but rather a process that equips baby (and you, too) to be better able to handle life’s stresses. If baby is wiggling or appears stiff and tense, open the infant massage ritual with a touch-relaxation technique: Engage baby in eye-to-eye contact before you start. Grasp baby’s wiggly or tense legs and bicycle them while speaking softly, “Relax, relax…” This opener sets baby up to associate the touch-relaxation motions and sounds with the pleasant ritual to follow. This is baby’s opening cue that the play is about to begin. And relax yourself. A tense baby doesn’t relax to the touch of tense hands. Read and feel the response of your baby rather than making infant massage a mechanical exercise. Begin with the legs, the easiest to work with and the easiest part for baby to accept. Hold the foot with one hand and “milk” the leg from ankle to thigh with the other. Then, hold the thigh with both hands, as if holding a baseball bat, and using a gentle twisting and squeezing motion, move your hands from thigh to foot. Finally, roll the leg between your hands from knee to ankle. As you move down the leg to the foot, do a series of thumb presses with your hand encircling the ankle and foot. For the finishing touch, lightly stroke the legs from thigh to feet before you move onto the trunk. To massage the abdomen, slide your whole palm and fingers in a hand-over-hand circular motion, working from the rib cage downward. Next, slide both hands around the abdomen in clockwise circular movements. To relax a tense, bloated abdomen try the “I Love U” stroke . Finally, using fingertip pressure, try “walking” over the abdomen. For the chest, slide both hands along the rib cage from center to sides and back again, like flattening the pages in a book. The arms and hands are done in the same fashion as the legs and the feet, beginning, however, with a “pit stop” (massaging the lymph nodes in the armpit). The face has special strokes all its own – whole-handed smoothing; lightly pressing, pushing, and circling with the thumbs; and finally combing from forehead over cheeks with light fingertip strokes. Last, do the back, everyone’s favorite. With the pads of your fingers, lightly rub small circles all over the back. Then gently come with the fingertips from back over buttocks and legs to ankles. These strokes are the main ones that our infant massage instructor teaches to the patients in our practice. There are many other creative touches that you and your baby will work out together as you learn the art of infant massage. You might also take a look at the book by Vimala Schneider (Bantam Books, 1989), complete with photographs illustrating the strokes. Remember, as in all aspects of parenting, read your baby along with the book. You can also purchase videotapes to learn the technique or obtain the services of a certified infant-massage instructor who can teach you personally. Giving an infant massage is like reading a long poem. If both of you are in the mood to hear the whole poem, you start at the beginning and go line by line in an orderly sequence (baby knows what to expect). If time is short or the setting is not conducive to poetic retreat you can jump in anywhere with a few favorite lines that you have memorized. For example, if you have had the whole massage earlier in the day, then at bedtime it is possible to savor the beauty of the whole by doing only the arm or the back massage to send your little one off to dreamland. Since he has learned to associate this with relaxing, you have a wonderful finishing touch to your bedtime routine, and one that can be administered by father.